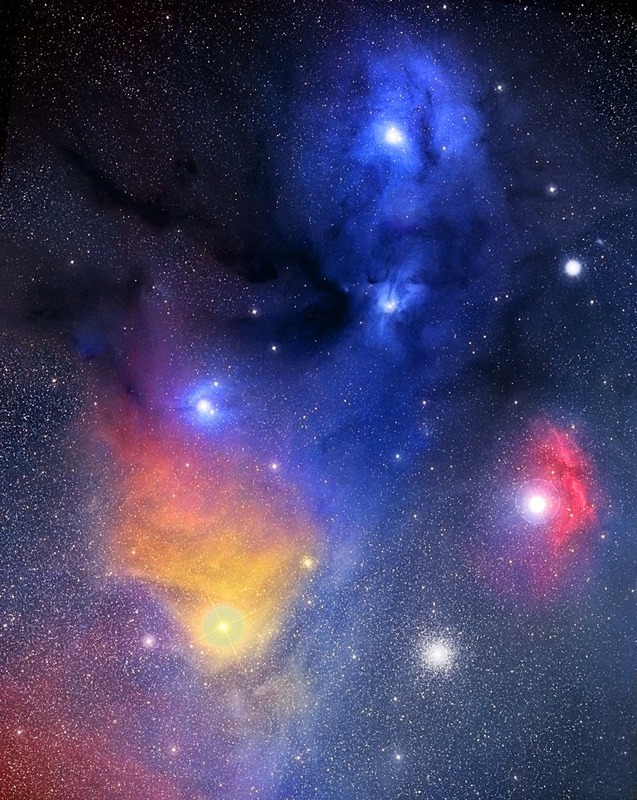 The Rho Ophiuchi Nebula: A Clue to Origin of Earth’s Key Molecules? 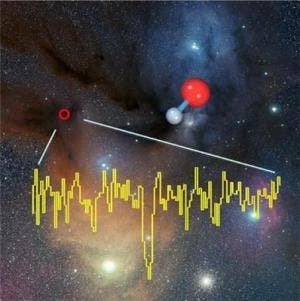 Hydrogen peroxide (H2O2) a key molecule for both astronomers and chemists has been discovered close to the star Rho Ophiuchi, about 400 light-years away. The region contains very cold (around -250 degrees Celsius), dense clouds of cosmic gas and dust, in which new stars are being born. Its formation is closely linked to two other familiar molecules, oxygen and water, which are critical for life. Because much of the water on our planet is thought to have originally formed in space, scientists are eager to understand how it is created. An international team of astronomers made the discovery in 2011 with the Atacama Pathfinder Experiment telescope (APEX), situated on the 5000-metre-high Chajnantor plateau in the Chilean Andes. The clouds are mostly made of hydrogen, but contain traces of other chemicals, and are prime targets for astronomers hunting for molecules in space. Telescopes such as APEX, which make observations of light at millimetre- and submillimetre-wavelengths, are ideal for detecting the signals from these molecules. "We were really excited to discover the signatures of hydrogen peroxide with APEX. We knew from laboratory experiments which wavelengths to look for, but the amount of hydrogen peroxide in the cloud is just one molecule for every ten billion hydrogen molecules, so the detection required very careful observations," says Per Bergman, astronomer at Onsala Space Observatory in Sweden. Bergman is lead author of the study, which was published in the journal Astronomy & Astrophysics. "We don't understand yet how some of the most important molecules here on Earth are made in space. But our discovery of hydrogen peroxide with APEX seems to be showing us that cosmic dust is the missing ingredient in the process," says Berengere Parise, head of the Emmy Noether research group on star formation and astrochemistry at the Max-Planck Institute for Radio Astronomy in Germany, and a co-author of the paper. This month, SOFIA, the "Stratospheric Observatory for Infrared Astronomy," completed its first series of science flights, using the German Receiver for Astronomy at Terahertz Frequencies (GREAT). They include first detections of new interstellar molecules and important spectral lines in space, and address different stages of the star formation process. As a joint project between NASA and the German Aerospace Center (Deutsches Zentrum für Luft- und Raumfahrt, DLR), SOFIA operates a 2.7-m telescope in a modified Boeing 747SP aircraft and is the world's largest ever airborne infrared observatory. SOFIA flies at altitudes as high as 13700 meters to provide access to astronomical signals at far-infrared wavelengths that would otherwise be blocked due to absorption by water vapour in the atmosphere. The SOFIA observatory and the GREAT instrument open the far-infrared skies for high-resolution spectroscopy, and GREAT pushes its technology to higher frequencies and sensitivities than ever reached before. The colors of the Rho Ophiuchi (oh'-fee-yu-kee) clouds (image above) highlight the many processes that occur there. Blue light from the star Rho Ophiuchi and nearby stars reflects more efficiently off this portion of the nebula than red light. The red and yellow regions shine primarily because of emission from the nebula's atomic and molecular gas. Light from nearby blue stars – more energetic than the bright star Antares – knocks electrons away from the gas, which then shines when the electrons recombine with the gas. The dark regions are caused by dust grains – born in young stellar atmospheres – which effectively block light emitted behind them. The Rho Ophiuchi star clouds, well in front of the globular cluster M4 visible above on far lower left, are even more colorful than humans can see – the clouds emits light in every wavelength band from the radio to the gamma-ray. The optical color image above of the rho Ophiuchi star formation region, about 400 light-years from Earth, with dark dusty filamentary gas clouds. The position of the optically obscured low-mass protostar IRAS16293-2422 towards which interstellar deuterated hydroxyl OD has been detected is marked with a red circle. The absorption line spectrum, observed with GREAT onboard SOFIA, displays the molecule’s fingerprint at a frequency of 1.3915 Terahertz (or 0.215 mm wavelength). The inset shows the OD molecule (red: oxygene, gray: deuterium), an isotopic substitute of hydroxyl (OH) with the hydrogen atom replaced by heavier deuterium. This deuterated molecule is an important marker in the formation of interstellar water and may serve as a chemical clock in the early star formation process.The bright yellowish star in the bottom left is Antares, one of the brightest stars in the sky. Below and to Antares’ right is the globular cluster Messier 4.